In “The Finish,” journalist Mark Bowden quotes the president as saying he thought he would be in a strong political position to argue in favor of giving bin Laden the full rights of a criminal defendant if bin Laden went on trial for masterminding the Sept. 11 attacks. 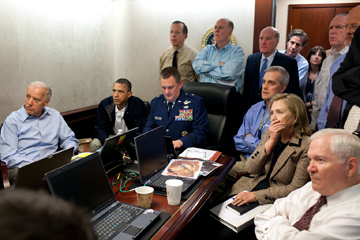 But Bowden says Obama expected bin Laden to go down fighting. A team of Navy SEALs raided bin Laden’s compound in Abbottabad, Pakistan in May 2011 and killed the terrorist leader. The Associated Press purchased a copy of “The Finish,” which is due to come out Oct. 16, a few weeks before the presidential election. The revelation that Obama hoped to capture bin Laden may provide political fodder for Republicans who have criticized the Obama administration for trying to bring terrorists from Guantanamo Bay, Cuba, and overseas to trials in U.S. courts. “Frankly, my belief was if we had captured him, that I would be in a pretty strong position, politically, here, to argue that displaying due process and rule of law would be our best weapon against al-Qaida, in preventing him from appearing as a martyr,” Obama is quoted saying in an interview with Bowden. Obama believed that affording terrorists “the full rights of criminal defendants would showcase Ameri­ca’s commitment to justice for even the worst of the worst,” Bowden writes. New York congressman Peter King said he would have been “totally opposed” to a trial. “To give him a forum and all the constitutional protections that a U.S. citizen would receive when he was clearly a war criminal is part of the defensive and apologetic attitude” of the Obama administration, the Republican said. U.S. officials have said the Navy team was ordered to capture bin Laden if he surrendered or kill him if he threatened them. Bowden asserts that the SEALs could have taken bin Laden alive but had no intention of doing so. In a separate account of the raid that was published last month, one member of the Navy team, Matt Bissonnette, wrote that the SEALS climbed a stairway inside the compound and opened fire when bin Laden poked his head around a doorway. Bissonnette wrote that bin Laden’s hands were concealed and the SEALS presumed he was armed, so they shot him. Bowden’s extensive access to top figures, including the president and high-ranking officials in the Pentagon and CIA, may revive criticism from Republicans that the White House allegedly leaks about the raid to burnish its foreign policy record during an election year. After McRaven told then-CIA director Leon Panetta he had a “Geronimo” call — the radio code that meant the SEALs had found bin Laden — the admiral realized he had not asked whether bin Laden was dead or had been captured. McRaven checked again with the SEALs on the ground before relaying that bin Laden had likely been killed. But McRaven cautioned Panetta to “manage his expectations” until they had more definitive proof, by comparing his photographs with the dead man. Later, McRaven told the president that he felt sure that they killed bin Laden but said the military needed to complete DNA analysis to be certain, Bowden writes. The book’s publication may complicate the Pentagon's attempts to punish Bissonnette for his book. Writing under the pseudonym Mark Owen, Bissonnette published “No Easy Day” without submitting it for a security review by the Pentagon. Bowden was under no such requirement to have the book vetted because he was not a government or military employee.